SEASONAL LINES Seasonal lines are largely dedicated to tourists and are activated on particular occasions, such as during the Venice Carnival or in the spring and summer to facilitate the mobility of large numbers of visitors. These seasonal lines provide rapid, direct backup to the city centre lines down the Canal Grande and Giudecca Canal. Line 5 on the other hand directly links the island of Murano with Piazza San Marco and the city centre of Venice, taking an external route. CITY CENTER LINES These are the lines which crisscross the "heart" of the city, exploiting the two largest inner canals, the Canal Grande, probably the world's most famous canal, and ....the Giudecca Canal, large and deep enough to allow even the arrival of cruise ships. The city centre lines connect a number of access points such as Tronchetto, Piazzale Roma and the railway station with the Venice of shops, monuments and museums, passing through the San Marco Basin as far as Lido di Venezia, famous for the beauty of its beaches and its nature reserves. CIRCULAR LINES These lines with a roughly circular route connect the perimeter of the city touching points of great cultural and commercial interest throughout the area. With the circular lines, you can easily reach the islands of Lido and Murano (famous for its glass products), passing through or starting from the railway station, Piazzale Roma and near Piazza San Marco. With the circular, you can also get off and reach Venice City Hospital after a short walk along a route free from architectural barriers. LAGOON LINES These lines connect Venice with the most important islands in the lagoon, both in the north lagoon (Mazzorbo, Burano, Torcello, Sant’Erasmo) and the south lagoon. The lagoon lines also link transport nodes on the mainland and in Venice province with the city centre. You can in fact reach Venice directly from Punta Sabbioni, Treporti and Chioggia. The lagoon lines also include the ferry-boat line no. 17 connecting Lido di Venezia and the Tronchetto terminal and the bus line no. 11 linking Lido di Venezia with the island of Pellestrina. The San Lazzaro - Lido Casinò section of line no. 20 is seasonal, to verify availability contact the Hellovenezia Call Center (+39)-041-2424. TERMINAL LINES The terminal lines are a group of rapid lines with few stops which rapidly connect Venice with the mainland terminals managed by companies in the ACTV group. They consist largely of the Alilaguna group of lines and the line 16. Burano is a collection of islands linked by bridges and divided by canals, located approximately 9km to the north-east of Venice. Historians are divided as to whether the island acquired its name from the Buriana family, who were amongst the first settlers, or from the smaller neighbouring island of Buranello from whence its first inhabitants originated. 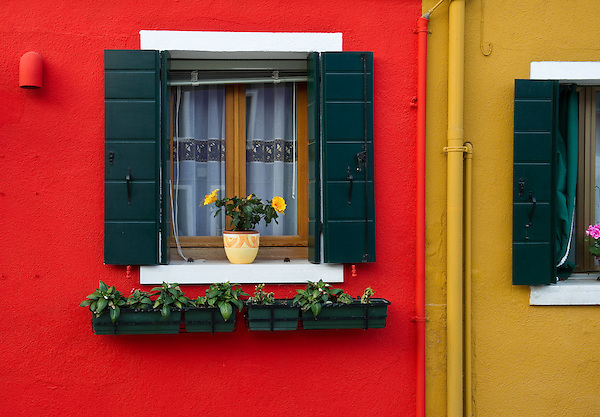 Burano is a densely populated, neat and attractive little town with a population of around 5,000. Visitors usually remark on the brightly painted houses which create a colourful ambiance: a feature which the authorities have attempted to preserve by insisting that residents observe the municipal colour scheme when painting their homes.